Before you watch this video we urge you to watch the previous video; Day Trading Strategies General Tips. This is for your own good as the previous video explains how you can best use the Day Trading Strategies Videos and how to safeguard yourself against too bigger losses when testing your own strategies. The Bollinger Bands Squeeze Strategy uses 4 components which are Bollinger Bands, Bollinger Band Width, Bollinger Band %B and Volume. If you are not familiar with these indicators I strongly recommend that you watch our free videos on these indicators. Bollinger Bands and Bollinger Band Width is used to determine a period of very low volatility. This is because very often after a period of low volatility price will break out with a force that gives the trader an opportunity to profit from the move. 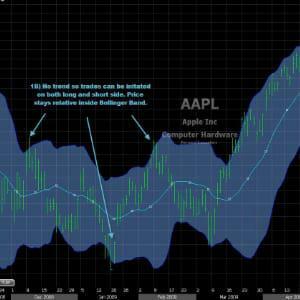 The Bollinger Band %B is used for extra evidence that the breakout will not be a fake one. It is used in a way that if %B is above the midpoint indicating that price is closer to upper band than lower band then it supports a breakout to the upside. If a breakout happens to the upside but %B has been below midpoint the majority of the time than the odds favours that it might be a fake breakout. This is because prior to the breakout the sellers were in control instead of the buyers. The last component used in this day trading strategy is volume. This is a very important component as volume alone can save you from a lot of fake breakouts. If there is not a significant increase in volume on the break of resistance/support than the chances are that the move is not strong enough to continue in your direction. The setup explained in very simple terms would be look for contracted Bollinger Bands with a low reading of Bollinger Band Width. When looking for long make sure the %B has been above the midpoint prior to the break of the resistance. Final thing is the volume increase. The trigger is fired when resistance is taken out. When looking for short then %B needs to have been below %B and price should break support. Volume is also important when going short. To increase the odds of success try only taking trades with the trend and preferable the first successful setup in that trend. Like with any other system this strategy will not work all the time and is HIGHLY dependent on the right market conditions. Examples of wrong market conditions are around holidays where volume dries up and around FED announcements or other major news where sudden reversals can occur.